Jitendra, an inhabitant of Sewar town, was feeling frustrated and depressed owing to unemployment for a long time. Though he had all the zeal to undertake some productive work but his financial condition and lack of any technical skill was obstructing him in fulfilling his aspiration. 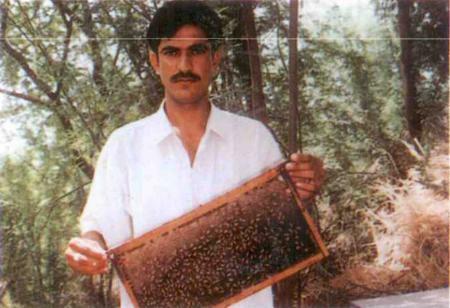 Jitendra started beekeeping activity with only 10 boxes in the year 2000. Initially he placed his boxes with large beekeepers. Gradually as his profit from this activity increased, he invested back major part of the profit towards increasing the number of bee units and the boxes. Today, in a span of 4 years, he has raised the number of bee boxes from 10 to 70. By this process he has not only been able to earn from a single activity i.e honey but also from the sale of bees and bee boxes. Now he earns more than Rs.2 lac per annum. At one time when he had only 25-30 bee boxes, during a summer season he was shifting them to a nearby orchard. As this number grew beyond 50, he needed to transport them to cooler places like Dehradun and surrounding areas. This raised the problem of transportation of boxes. Therefore, he bought a four wheeler to migrate the bee colonies with boxes from one place to other. This facility also provided cheap transportation to other beekeepers to migrate their bee colonies and helped them in finding new markets for honey. Migration is a key factor in bee keeping activity because in Bharatpur mustard flora is available only for 4 months and for rest of the year they have to migrate bee colonies to other places for flora. Also, during summer the temperature gets unbearably hot for bee colonies. Jitendra's enterprising zeal has resulted in changing his life style. Now he has a four wheeler and a mobile phone for business and personal purposes. Jitendra, an unemployed youth till the year 2000, is now a youngmens' model for contemporary rural youth. Seeing the success of Jitendra, which was beyond the expectations of majority of the youth in his and adjoining half a dozen villages, they too felt inspired to start beekeeping activity by obtaining loan like Jitendra. They are also doing their beekeeping work successfully and are earning Rs.3 to 4 thousand per month. In words of Jitendra "I am fortunate to have met Lupin officials and to get the required technical and financial assistance from them in right time during my depressing i phase of life." He now educates and inspires the young people of his area by stating, that the work done with skill and honesty always succeeds. Economic joviality has been achieved by adopting this innovative skill for self-employment by hundreds of young men in Bharatpur district. An activity which was totally unheard off a decade back in the district has made Bharatpur the second highest honey producer district in India. Surprisingly beekeeping which is an activity based upon mustard crop also enhances mustard output due to cross pollination. In normal course of events bee-keeping activity should have been visualized, advocated and spread in Bharatpur villages by National Mustard Research Centre located in Bharatpur.